^ Kahlenberg, Richard (March 16, 2018). 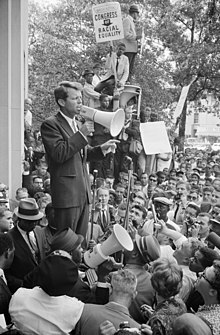 "The Inclusive Populism of Robert F. Kennedy". 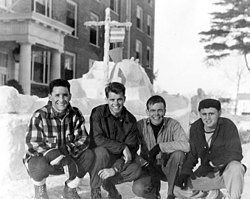 The Century Foundation. Retrieved September 19, 2018. ^ Arango, Tim. 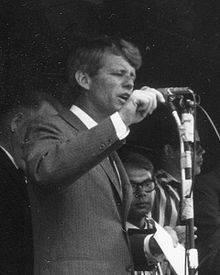 "A Campaign, a Murder, a Legacy: Robert F. Kennedy's California Story". The New York Times. Retrieved September 19, 2018. ^ "Law Day Address at the University of Georgia Law School". American Rhetoric. Archived from the original on August 22, 2016. Retrieved August 23, 2016. ^ a b "Federal Bureau of Investigation (FBI)". kingencyclopedia.stanford.edu. Archived from the original on June 9, 2015. 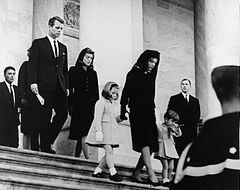 ^ Kennedy, Robert F. Kennedy, Maxwell Taylor (ed.). 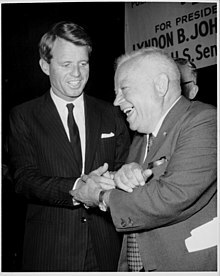 Make Gentle the Life of This World: The Vision of Robert F. Kennedy. Orlando, FL: Houghton Mifflin Harcourt. pp. 137–139. ISBN 978-0-15-100356-3. ^ a b Thurston Clark (2008). 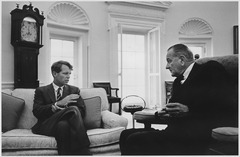 The Last Campaign: Robert F. Kennedy and 82 Days That Inspired America (ed.). "The Last Good Campaign". Vanity Fair. Archived from the original on December 20, 2014. 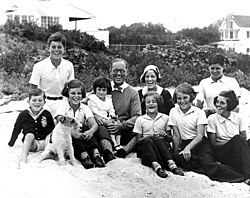 ^ "A Kennedy Family Postage Stamp Legacy". National Postal Museum. August 25, 2009. Retrieved June 5, 2018. 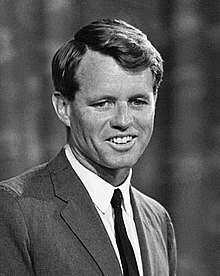 ^ "1979 15c Robert F. Kennedy for sale at Mystic Stamp Company". Mystic Stamp Company. Retrieved June 5, 2018.